Mid-Atlantic Controls Corporation (MACC) is an independent control systems contractor specializing in commercial and industrial facility automation systems. We provide multi-disciplinary automation solutions to corporate, institutional and industrial customers. 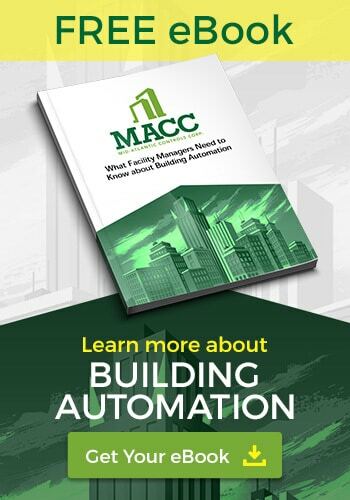 As an independent contractor, Mid-Atlantic Controls provides solutions from a variety of Building Automation System manufacturers and can service and expand systems installed by other contractors. Mid-Atlantic Controls provides solutions designed to meet client needs, schedules and budgets while developing custom solutions that frequently result in long-term cost savings. MACC offers support systems which offer a combination of both BACnet and LONWorks/LonMark for Open Interoperability. This means that we are not tied to a specific manufacturer, but are able to provide the right system based on the automation needs, schedule and budget of our customers. For our customers, interoperability means freedom and flexibility in selecting a control manufacturer, servicing their facility and expanding their system in the future. These solutions range from engineering to installation to maintenance. Our track record of on time, quality controlled installations is impressive and reflects our commitment to self-perform all controls installation including electrical wiring. This provides us with the flexibility to offer our customers the highest quality of on-time performance unmatched by any of our competitors in Virginia. So whether your needs are commercial building energy management and control or industrial facility automation and instrumentation, Mid-Atlantic Controls Corporation is your best choice for control systems contracting. “On behalf of Kjellstrom + Lee, please accept this letter of appreciation and recognition of your team’s work at the WFS Walker 1D project. While your entire team played an integral part in the project’s success, Ruben Yanez stands out in regard to his proactive approach and exemplary customer service. MACC was contracted directly with LA Lacy for this project, although Ruben and Bruce Bolton provided a wealth of knowledge and assistance as the project team worked through installation and commissioning of a new Trane Stealth Chiller. Additionally, Ruben guided us through enhanced commissioning by Facility Dynamics. At the end of commissioning, there were several compliments to Ruben’s attitude, patience and knowledge. MACC is headquartered in Richmond, Virginia, but we serve clients across the Mid-Atlantic Region of Virginia, Maryland, North Carolina, West Virginia, Delaware, New Jersey, and beyond. Contact us to learn more about building automation systems or to get an estimate for your commercial building or new construction project.